توماس جفری هَنکس (انگلیسی جه: Thomas Jeffrey Hanks) اتا آمریکایی بازیگر هسته که هالیوود وسّه خله فیلمون کا هاکرده. وه جایزه‌ئون مختلفی من‌جمله گولدن گلوب، اوسکار، جایزه انجمن بازیگران فیلم و... ره بَوِرده. وه نقش‌های خله جالب و یادبموندستنی هم کا هاکرده. بعنوان مثال داوینچی کد، فیلادلفیا، فارست گامپ، کست اوی (دوردَکِت)، گرین مایل (سَوزِ راه)، آپولو ۱۳، کاپیتان فیلیپس و... واری. تا سال ۲۰۱۴، فیلم‌هایی که وه کا هاکرده فقط امریکا دله سرجمع 4.3 بیلیون دلار بروته بَیینه. ↑ Maslin, Janet (June 30, 1984). "Bachelor Party (1984)". The New York Times (The New York Times Company). http://www.nytimes.com/movie/review?res=9405E2DA1539F933A05755C0A962948260. Retrieved August 30, 2014. ↑ Maslin, Janet (July 19, 1985). "The Man With One Red Shoe (1985)". The New York Times (The New York Times Company). http://www.nytimes.com/movie/review?res=9802E3DF1538F93AA25754C0A963948260. Retrieved August 30, 2014. ↑ Goodman, Walter (August 16, 1985). "Volunteers (1985)". The New York Times (The New York Times Company). http://www.nytimes.com/movie/review?res=9405E3DC1F38F935A2575BC0A963948260. Retrieved August 30, 2014. ↑ Canby, Vincent (March 26, 1986). "The Money Pit (1986) A Domestic Comedy". The New York Times (The New York Times Company). http://www.nytimes.com/movie/review?res=9A0DE0DA1F3DF935A15750C0A960948260. Retrieved August 30, 2014. ↑ Schickel, Richard (August 4, 1986). "Cinema: Role Reversal Nothing in Common". Time. http://content.time.com/time/magazine/article/0,9171,961919,00.html. Retrieved August 30, 2014. ↑ Maslin, Janet (November 14, 1986). "Everytime We Say Goodbye (1986)". The New York Times (The New York Times Company). http://www.nytimes.com/movie/review?res=9A0DE1D8173EF937A25752C1A960948260. Retrieved August 7, 2014. ↑ Benson, Shiela (June 26, 1987). "Movie Reviews : One Hits Its Target; Another Nearly Does : 'Dragnet'". Los Angeles Times (Tribune Publishing). http://articles.latimes.com/1987-06-26/entertainment/ca-6586_1_disaster-movie. Retrieved August 27, 2014. ↑ Maslin, Janet (June 3, 1988). "Review/Film; Tom Hanks as a 13-Year-Old, in 'Big'". The New York Times (The New York Times Company). http://www.nytimes.com/1988/06/03/movies/review-film-tom-hanks-as-a-13-year-old-in-big.html. Retrieved August 30, 2014. ↑ Easton, Nina (September 29, 1988). "Just a Couple of Stand-Ups : Sally Field and Tom Hanks Have a Lot Riding on Roles as Comics in 'Punchline'". Los Angeles Times (Tribune Publishing). http://articles.latimes.com/1988-09-29/entertainment/ca-5977_1_tom-hanks. Retrieved August 30, 2014. ↑ Turner, Adrian. "The 'Burbs". Radio Times (Immediate Media Company). http://www.radiotimes.com/film/mkk7y/the-burbs. Retrieved August 30, 2014. ↑ James, Caryn (July 28, 1989). "Turner and Hooch (1989) A Droll Buddy Who Drools and Eats a Stereo Speaker". The New York Times (The New York Times Company). http://www.nytimes.com/movie/review?res=950DE7DB143BF93BA15754C0A96F948260. Retrieved September 1, 2014. ↑ Kempley, Rita (March 9, 1990). "‘Joe Versus the Volcano’ (PG)". The Washington Post (Nash Holdings LLC). http://www.washingtonpost.com/wp-srv/style/longterm/movies/videos/joeversusthevolcanopgkempley_a09ffa.htm. Retrieved August 31, 2014. ↑ Travers, Peter (December 21, 1990). "The Bonfire of the Vanities". Rolling Stone (Wenner Media LLC). http://www.rollingstone.com/movies/reviews/the-bonfire-of-the-vanities-19901221. Retrieved July 31, 2014. ↑ Canby, Vincent (February 21, 1992). "Radio Flyer (1992)". The New York Times (The New York Times Company). http://www.nytimes.com/movie/review?res=9E0CEEDF1E3EF932A15751C0A964958260. Retrieved July 10, 2014. ↑ Canby, Vincent (July 1, 1992). "A League of Their Own (1992)". The New York Times (The New York Times Company). http://www.nytimes.com/movie/review?res=9E0CEED81F3EF932A35754C0A964958260. Retrieved August 1, 2014. ↑ "'Sleepless In Seattle' Anniversary: Tom Hanks & Meg Ryan Classic Turns 20". The Huffington Post. June 25, 2013. http://www.huffingtonpost.com/2013/06/25/sleepless-in-seattle-anniversary_n_3496495.html. Retrieved August 1, 2014. ↑ Maslin, Janet (December 22, 1993). "Review/Film: Philadelphia; Tom Hanks as an AIDS Victim Who Fights the Establishment". The New York Times (The New York Times Company). 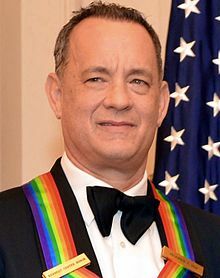 http://www.nytimes.com/1993/12/22/movies/review-film-philadelphia-tom-hanks-aids-victim-who-fights-establishment.html. Retrieved July 10, 2014. ↑ Maslin, Janet (July 6, 1994). "Forrest Gump (1994)". The New York Times (The New York Times Company). http://www.nytimes.com/movie/review?res=9F02EFDB1F3CF935A35754C0A962958260. Retrieved July 10, 2014. ↑ Maslin, Janet (June 30, 1995). "Apollo 13 (1995)". The New York Times (The New York Times Company). http://www.nytimes.com/movie/review?res=990CE0D7123FF933A05755C0A963958260. Retrieved July 31, 2014. ↑ Maslin, Janet (November 22, 1995). "Toy Story (1995)". The New York Times (The New York Times Company). http://www.nytimes.com/movie/review?res=9905EEDA1339F931A15752C1A963958260. Retrieved July 31, 2014. ↑ "Saving Private Ryan (1998)". The New York Times (The New York Times Company). http://www.nytimes.com/movies/movie/163037/Saving-Private-Ryan/details. Retrieved July 31, 2014. ↑ Ebert, Roger (December 18, 1998). You've Got Mail. Roger Ebert. بازیابی در July 31, 2014. ↑ Ebert, Roger (November 24, 1999). Toy Story 2. Roger Ebert. بازیابی در July 31, 2014. ↑ Turan, Kenneth (December 10, 1999). "Movie Review Traversing 'The Green Mile'". Los Angeles Times (Tribune Publishing). http://articles.latimes.com/1999/dec/10/entertainment/ca-42354. Retrieved August 31, 2014. ↑ Travers, Peter (December 18, 2000). "Cast Away". Rolling Stone (Wenner Media LLC). http://www.rollingstone.com/movies/reviews/cast-away-20001218. Retrieved August 7, 2014. ↑ My Big Fat Greek Wedding. Box Office Mojo. بازیابی در July 10, 2014. ↑ Ebert, Roger (July 12, 2002). Road to Perdition. Roger Ebert. بازیابی در July 31, 2014. ↑ Ebert, Roger (December 25, 2002). Catch Me If You Can. Roger Ebert. بازیابی در August 25, 2014. ↑ Scott, A. O. (March 26, 2004). "The Ladykillers (2004)". The New York Times (The New York Times Company). http://www.nytimes.com/movie/review?res=9401E2DB1230F935A15750C0A9629C8B63. Retrieved August 1, 2014. ↑ Connie and Carla. Box Office Mojo. بازیابی در July 10, 2014. ↑ Ebert, Roger (June 18, 2004). The Terminal. Roger Ebert. بازیابی در August 30, 2014. ↑ Elvis Has Left the Building (2004). Reelfilms (July 30, 2005). بازیابی در July 31, 2014. ↑ Elvis Has Left the Building. The Numbers. بازیابی در September 6, 2014. ↑ "The Polar Express (2004)". The New York Times (The New York Times Company). http://www.nytimes.com/movies/movie/286524/The-Polar-Express/details. Retrieved September 1, 2014. ↑ Leydon, Joe (October 5, 2005). "Review: ‘Magnificent Desolation: Walking on the Moon’". Variety (Penske Media Corporation). http://variety.com/2005/film/reviews/magnificent-desolation-walking-on-the-moon-1200521293/. Retrieved September 5, 2014. ↑ Scott, A. O. (May 18, 2006). "The Da Vinci Code (2006)". The New York Times (The New York Times Company). http://www.nytimes.com/2006/05/18/movies/18code.html?pagewanted=all. Retrieved August 30, 2014. ↑ Corliss, Richard (January 19, 2007). "John Wayne: Still Tops". Time. http://content.time.com/time/arts/article/0,8599,1580564,00.html. Retrieved July 31, 2014. ↑ Ant Bully. Box Office Mojo. بازیابی در July 10, 2014. ↑ Starter for 10. Box Office Mojo. بازیابی در July 10, 2014. ↑ Evan Almighty. Box Office Mojo. بازیابی در July 10, 2014. ↑ Von Tunzelmann, Alex (November 18, 2010). "The fog of Charlie Wilson's War". The Guardian (Guardian Media Group). http://www.theguardian.com/film/2010/nov/18/reel-history-charlie-wilsons-war. Retrieved September 5, 2014. ↑ Hunter, Stephen (July 27, 2007). "What a Blast!". The Washington Post (Nash Holdings LLC). http://www.washingtonpost.com/wp-dyn/content/article/2007/07/27/AR2007072700145.html. Retrieved July 31, 2014. ↑ "Mamma Mia (2008) - Production credits". The New York Times (The New York Times Company). http://www.nytimes.com/movies/movie/385390/Mamma-Mia-/credits. Retrieved August 31, 2014. ↑ "City of Ember (2008) - Production credits". The New York Times (The New York Times Company). http://www.nytimes.com/movies/movie/399607/City-of-Ember/details. Retrieved August 31, 2014. ↑ Holden, Stephen (March 19, 2009). "The Great Buck Howard (2008)". The New York Times (The New York Times Company). http://www.nytimes.com/2009/03/20/movies/20buck.html. Retrieved August 7, 2014. ↑ "My Life in Ruins (2009)". The New York Times (The New York Times Company). http://www.nytimes.com/movies/movie/448813/My-Life-in-Ruins/details. Retrieved August 1, 2014. ↑ Corliss, Richard (May 13, 2009). "Holy Hanks! Fun and Games in Angels & Demons". Time. http://content.time.com/time/arts/article/0,8599,1897543,00.html. Retrieved August 30, 2014. ↑ Where the Wild Things Are. Box Office Mojo. بازیابی در July 10, 2014. ↑ Beyond All Boundaries Cast and Crew. National World War II Museum. بازیابی در July 10, 2014. ↑ Turan, Kenneth (June 18, 2010). "Movie review: 'Toy Story 3'". Los Angeles Times (Tribune Publishing). http://articles.latimes.com/2010/jun/18/entertainment/la-et-toystory-20100618. Retrieved August 20, 2014. ↑ Rocchi, James. "Closing Up the Toy Box?". MSN Movies. Archived from the original on July 1, 2010. http://www.webcitation.org/5qt8skMym. Retrieved June 15, 2011. ↑ Holden, Stephen (June 30, 2011). "Larry Crowne (2011)". The New York Times (The New York Times Company). http://www.nytimes.com/2011/07/01/movies/tom-hanks-and-julia-roberts-in-larry-crowne-review.html. Retrieved August 30, 2014. ↑ Radish, Christina (November 21, 2011). "Director Angus MacLane Talks New Toy Story Short Small Fry Which Plays in Front of The Muppets". Collider. http://collider.com/angus-maclane-small-fry-toy-story-interview/127814/. Retrieved December 26, 2011. ↑ Pols, Mary (December 21, 2011). "Brace Yourselves for Extremely Loud & Incredibly Close". Time. http://entertainment.time.com/2011/12/21/brace-yourselves-for-extremely-loud-and-incredibly-close/. Retrieved August 30, 2014. ↑ "Cloud Atlas". The New York Times (The New York Times Company). http://www.nytimes.com/movies/movie/463175/Cloud-Atlas/details. Retrieved August 4, 2014. ↑ Goldberg, Matt (October 10, 2012). "Watch Pixar’s New Toy Story Short Partysaurus Rex". Collider. http://collider.com/toy-story-partysaurus-rex-short/201312/. Retrieved October 10, 2012. ↑ Sneider, Jeff (August 16, 2012). "Tom Hanks, Gary Goetzman to produce JFK drama". Variety (Penske Media Corporation). http://variety.com/2012/film/news/tom-hanks-gary-goetzman-to-produce-jfk-drama-1118057932/. Retrieved July 10, 2014. ↑ Dargis, Manohla (October 10, 2013). "A Thriller Armed With Thought". The New York Times (The New York Times Company). http://www.nytimes.com/2013/10/11/movies/captain-phillips-stars-tom-hanks-as-a-high-seas-hostage.html?pagewanted=all. Retrieved August 4, 2014. ↑ Rochlin, Margy (January 3, 2014). "Not Quite All Spoonfuls of Sugar". The New York Times (The New York Times Company). http://www.nytimes.com/2014/01/05/movies/awardsseason/tom-hanks-and-emma-thompson-discuss-saving-mr-banks.html?_r=0. Retrieved August 4, 2014. ↑ Debruge, Peter (October 4, 2015). "Film Review: 'Bridge of Spies'". Variety (Penske Media Corporation). http://variety.com/2015/film/reviews/bridge-of-spies-film-review-1201609677/. Retrieved October 4, 2015. ↑ Tom Hanks in Talks to Reunite With Meg Ryan in 'Ithaca'. The Hollywood Reporter. Prometheus Global Media (June 25, 2014). بازیابی در July 27, 2014. ↑ Rothman, Michael (October 30, 2015). Meg Ryan on How Divorce From Dennis Quaid Influenced New Movie. ABC News. بازیابی در November 29, 2015. ↑ McNary, Dave (November 11, 2014). "'My Big Fat Greek Wedding 2' Heading for Universal With 'Nanny McPhee' Director". Variety (Penske Media Corporation). http://variety.com/2014/film/news/my-big-fat-greek-wedding-2-universal-1201353051/. Retrieved June 24, 2015. ↑ Barraclough, Leo (August 8, 2014). "Icon Acquires U.K. Rights to Tom Hanks Starrer 'A Hologram for the King'". Variety (Penske Media Corporation). http://variety.com/2014/film/news/icon-acquires-u-k-rights-to-tom-hanks-starrer-a-hologram-for-the-king-1201277713/. Retrieved September 5, 2014. ↑ Dugan, Christina (October 2, 2015). "First Look: Tom Hanks as Heroic Pilot Sully Sullenberger". People (Time Inc.). http://www.people.com/article/tom-hanks-plays-heroic-pilot-sully-sullenberger. Retrieved November 29, 2015. ↑ Lesnick, Silas (April 27, 2015). "Production Begins on Ron Howard's Da Vinci Code Sequel, Inferno". ComingSoon.net. http://www.comingsoon.net/movies/news/434441-production-begins-on-ron-howards-da-vinci-code-sequel-inferno. Retrieved April 28, 2015. ↑ Fleming Jr, Mike (December 15, 2014). "Tom Hanks Eyes David Eggers' Novel 'The Circle' With James Ponsoldt: Hot Package". Deadline.com. Penske Media Corporation. http://deadline.com/2014/12/tom-hanks-eyes-david-eggers-novel-the-circle-with-james-ponsoldt-hot-package-1201325646/. Retrieved September 12, 2015. ↑ Jaafar, Ali (November 3, 2015). "Liam Neeson In Talks To Topline Watergate Pic 'Felt' With Peter Landesman Helming – AFM". Deadline.com. Penske Media Corporation. http://deadline.com/2015/11/liam-neeson-felt-movie-watergate-peter-landesman-1201605319/. Retrieved May 31, 2016.